Kamen Rider EX-AID: Another Ending - Deleted Characters To Return! 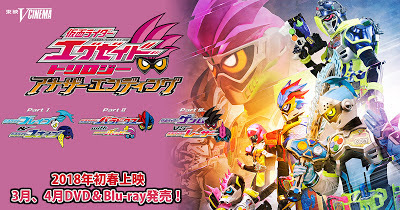 Toei has released bunch of information for their next V-Cinema presentation, Kamen Rider EX-AID: Another Ending regarding the return of the deleted characters from the TV series. According to this information, Hiiro's girlfriend, Saki, who's data was deleted in the series will be restored in the Kamen Rider Brave & Kamen Rider Snipe part where she will be coupled with a revived Ren Amakagami. Oh, you gonna get got by Hiiro. In the Kamen Rider Para-DX With Kamen Rider Poppy part, the new Genm Corp. president Tsukuru will finally complete the "Bozu of Tera" game from the TV series. And lastly, the former evil president of Genm Corp. and father to the meme lord, the one and only Masamuna Dan a.k.a Kamen Rider Chronos will also appear in all three parts of the movie. Could this mean that he has been restored too? Take note that all threed movie will take place 2 years after the series ended. Masamune annoys the crap out of me. I'd really rather see a new villain. Saki has the most beautiful smile in all of Kamen Rider franchise. Not Memelord, its Meme God!